I consider this practically proof of how the states voted 2004 and of Kerry votes being stolen. If the Approval reflects how they voted (or at least how they would vote today), Bush lost(would lose) by over 4% in Florida, New Mexico, North Carolina, Missouri, Colorado, Arkansas, Iowa, Ohio, & Nevada. even if as obvious as the noses on their faces. 2. Yup, no way Ohio--OR Nevada--could have voted for Bush! Could you define your columns, and explain a little better what these numbers are. Are you pulling these numbers from the two linked sites? And how have you correlated them? It's a confusing jumble of numbers. with other information, the total picture is overwhelming. It's not just that almost all the votes in the country were tabulated by two companies using SECRET, PROPRIETARY software, it's that, in addition, both of these companies are run by rightwing Bushites. It's not just that the Ohio election was all screwed up--with missing voting machines, and tens of thousands of misdirected and disenfranchised voters--it's that ALL of the many incidents of vote suppression happened in Democratic precincts. It's not just that there were unfair voter purges in Florida, it's that all those who were purged were black voters (who vote about 80% Democratic). And on and on. The list of such facts is very long. 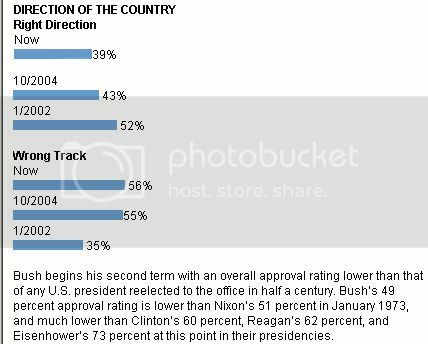 And then you look at the opinion polls over the last year, which show that Americans hugely disapprove of every major Bush policy, foreign and domestic--way up in the 60% to 70% range. The Iraq war. The deficit. Social Security. You name it. My favorite: 63% of Americans disapprove of torturing prisoners UNDER ANY CIRCUMSTANCES. Bush does not represent the majority of Americans on any issue! Not to mention Bush's approval ratings, which have been low for a year--much too low for him to be re-elected, said Zogby. At a mere 49% on the very day of his inauguration. And sinking like the Titanic--to about 40% today. Where is his support NOW? WHAT has changed? He's the same old Bush, up to the same old fascist tricks on behalf of his billionaire handlers, still running the same old unjust and murderous war. And then you go back and look at the election again. The Dems blew the Repubs away in new voter registration in 2004, nearly 60/40. New voters voted overwhelmingly for Kerry. Independent voters voted overwhelmingly for Kerry. Nader voters voted overwhelming for Kerry. Rove says they had an "invisible" get out the vote campaign. Right. What they had was a whole lot of truly invisible votes--invisible because they weren't real. The UC Berkeley statistical group found 130,000 to 260,000 phantom votes for Bush in Florida's 3 main Democratic counties--Miami-Dade, Broward and Palm Beach--in electronic vs paper voting. Those kind of votes. PHANTOM votes. And then you look at this post by chrisclub--and you find out what people really think of Bush and his thieving, murderous Oil Cartel. It's heartbreaking to know this, friends. But have courage, because we KNOW how to fix it. Those are very interesting stats, indeed. Thanks for the clarification. but it would make an interesting table--or color chart, or even US map. What the exit polls said on election day. What approval polls are saying today. approval ratings with the exit polls, to see how well they correlate. Could you direct me to one if you did it? chrisclub, thanks for adding the column headings and other clarifying material! is that his Numbers have been consistantly down since the election -- and have never stood up for the amount of people who supposedly voted "overwhelmingly" for him -- giving him his Mandate.